Students investigate three decades of tornado data through an interactive Story Map. The Story Map was created by Esri. Activity developed by Kristin Wegner for the UCAR Center for Science Education. Students understand how data and geospatial technology can be used to understand where tornadoes form and how they are classified. Students explore an interactive Story Map of three decades of tornado data, observe patterns, and summarize key points. Student groups present information about tornadoes. Students communicate characteristics of tornadoes and geographic distribution. MS-ESS3-3. Relationships can be classified as casual or correlational, and correlation does not necessarily imply causation. HS-ESS3-1. Natural hazards and other geologic events have shaped the course of human history; (they) have significantly altered the sizes of human populations and have driven human migrations. Begin by having the students explore the The Twister Dashboard Story Map independently or in small groups. Tell students to select one of the map's tools that they will share with the class. Have students generate questions they have about tornadoes while they explore the map (size, location, geography). Post these questions in the classroom and revisit them during the "intelectual engagement" activities (below). After students have had time to explore, project The Twister Dashboard Story Map and ask each student or group to share one of the tools with the class (zoom in and out, click on a year, click on a tornado, search the name of a town or state, etc.). Tell students that, for this project, they will explore parts of the United States to answer the following questions: Where do tornadoes happen? How far tornadoes travel? What patterns do tornadoes cause? How does geography affect the location of tornadoes? If students are not familiar with the geography of the United States, demonstrate the geographic features of the U.S. using a Google Map before students start their Story Map explorations. Have students work independently or in small groups to complete the activities. Have students graph characteristics related to the question they are investigating and note patterns in the graphed data. Perhaps they notice certain months have more tornadoes, certain regions have higher EF scale tornadoes, or some longer tornadoes cause more injuries, while some longer tornadoes do not cause more injuries (perhaps depending on the population in these areas). Have students compare tornado patterns from the 1950's with more recent data. Have them consider whether there are more tornadoes today or whether our ability to detect and report tornadoes is better today. The maximum over the past 40 years is in April, but the spatial maximum each year does not occur until August. Why do you think that is? Have students pick two regions (i.e. two cities in different states) and compare the number of tornadoes. Zoom in to each city to see the direction of tornado paths - are they similar or different? Why? Review the questions about tornadoes that students have posted in the classroom and encourage the class to discuss the answers. Have students examine the Google Map of the United States and compare various features of the United States and the locations with the highest and lowest concentrations of tornadoes. What correlations do they see in these two different maps of the United States? Use only the interactive map and allow students to interact with the Story Map to visually explore the characteristics of tornadoes. Have students research other data sets and compare them with the tornado Story Map data. Population data: Have students look at an area where a particularly devastating tornado occured. Does population change before and after the tornado? 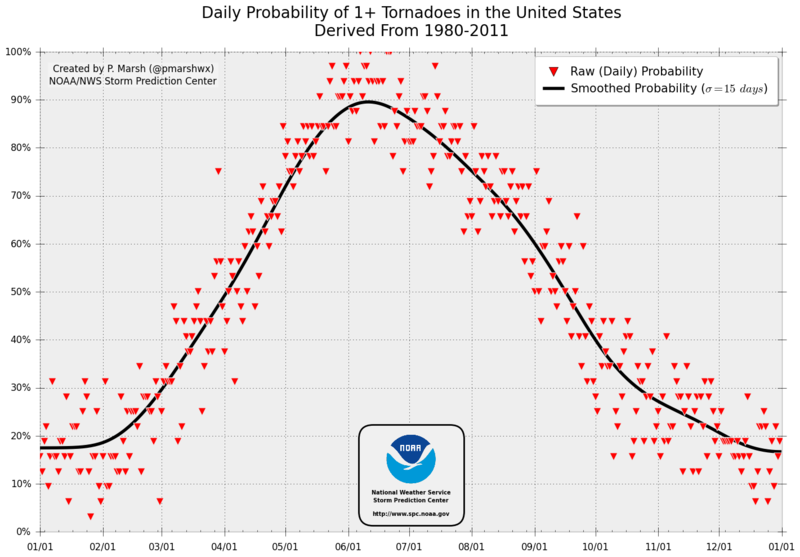 Daily Probability of a Tornado Anywhere in U.S. Based on Past 33 Years: What was the probability of a tornado occuring, and how does it compare the actual occurance of a tornado? Have students conduct additional research about a specific tornado. Using the Internet, they can look up the time of day when it occured, weather conditions leading up to the tornado, etc. 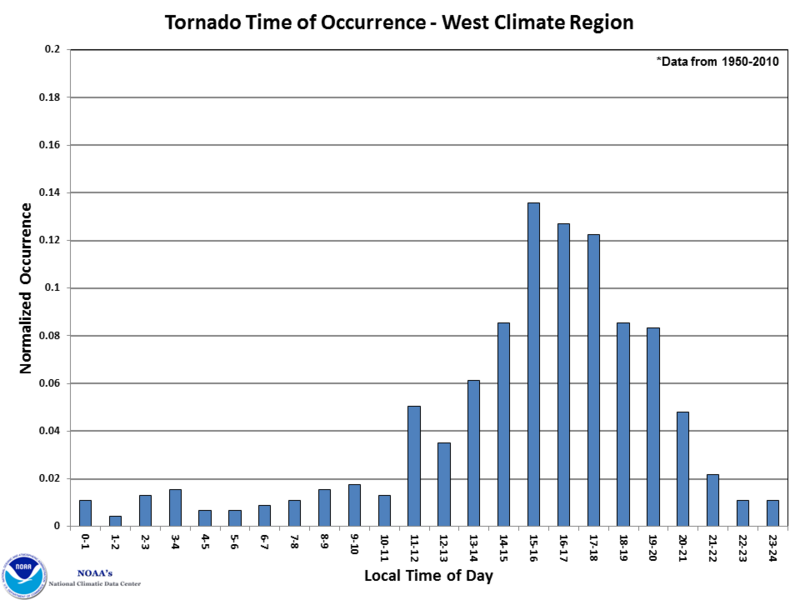 National Climatic Data Center: Historical Records and Trends provides good contextual data about tornadoes, including timing of occurance and annual totals. What Role Does Climate Change Play in Tornadoes? : This Scientific American article explores the connection between tornadoes and climate change. Ask students to come up with three assessment questions for their classmates based off of the interactive story map. You can either gather all of the questions and chose some for a written assessment, or have the students create a game for participation from the entire class.